Fraud committed by Alexander Dimitrief & Bradford Berenson in the Delhi High Court in Writ Petition Civil No. 1280/ 2012 regarding appearance of General Electric Company. 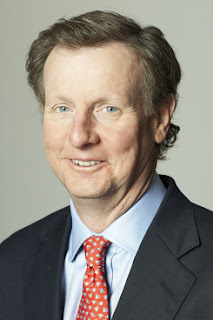 Brackett Denniston the General Counsel of GE until 31.10.2015 was also part of the fraud. General Electric Company is a large conglomerate incorporated in the United States. 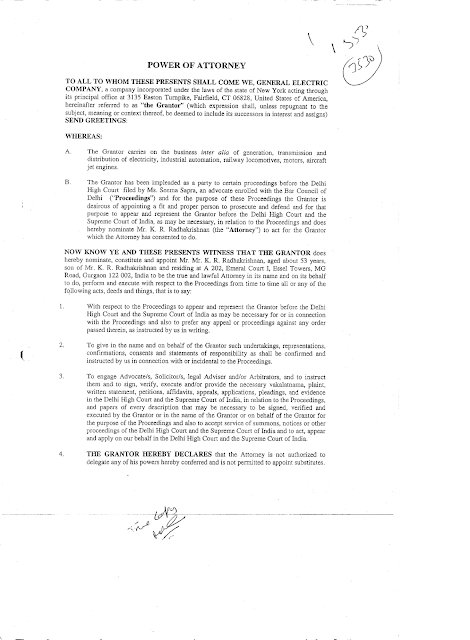 Notice was issued by the Delhi High Court to General Electric Company on 7.3.2012. Advocate Nanju Ganpathy appeared on 9.5.2012 claiming to represent General Electric Company and continued to appear thereafter. 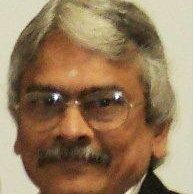 Mr Nanju Ganpathy is a Partner in the law-firm AZB & Partners. Affidavits were filed on behalf of General Electric Company through one K Radhakrishnan on 3.7.2012 and 3.8.2012. 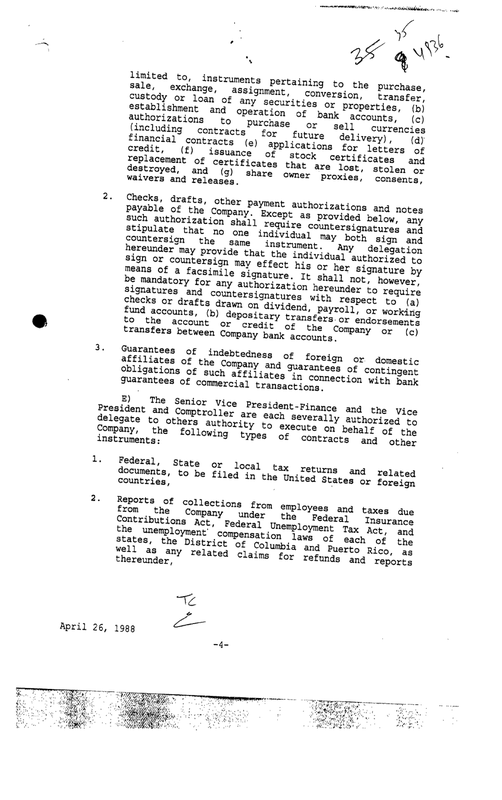 No authority documents establishing K Radhakrishnan as authorized signatory of General Electric Company were produced. At Appellant's request, order dated 12.10.2012 directed Nanju Ganpathy to produce authority documents to show that K Radhakrishnan was authorized signatory of General Electric Company. Nanju Ganpathy filed a photocopy of a document self-describing as a Power of Attorney executed by one Alexander Dimitrief on 4.5.2012. This document had a validity of one year. Appellant discovered that no vakalatnama had been filed so Appellant moved CM 19370/ 2012 (on 6 December 2012). Electronic case history maintained by the Delhi High Court registry shows a vakalatnama was filed only on 7.12.2012. CM 19683/2012 filed by Appellant on 14.12.2012 pointing out that the vakalatnama dated 7.12.2012 was invalid and did not annex the required authority documents. A new vakalatnama filed on 17.12.2012. This vakalatnama was signed by K Radhakrishnan claiming to be authorised signatory for General Electric Company under a Power of Attorney (POA) dated 4.5.2012 issued in his favour by Alexander Dimitrief of General Electric Company. Affidavit of K Radhakrishnan filed on 7.1.2013 producing an extract from the Board Minutes of General Electric Company (last revised on November 6, 2009) containing a Board Resolution (hereinafter referred to as the Board Resolution) which describes and limits the authority of individuals to sign documents (including court pleadings) on behalf of General Electric Company. Nanju Ganpathy filed another vakalatnama for General Electric Company on 16.7.2013. This vakalatnama was allegedly signed by Bradford Berenson on 9.5.2013. Attached to this vakalatnama dated 16.7.2013 was a photocopy of a document self-describing as a power of attorney allegedly executed on 29 April 2013 by Bradford Berenson on behalf of General Electric Company and apostilled in the United States on 10 May 2013. This was also only valid for one year. In any event, since the Power of Attorney dated 29.4.2013 was valid only for one year, it ceased to have legal effect from 30.4.2014 onwards. Therefore, even without going into the authenticity and legal validity of the authority documents and vakalatnamas filed on behalf of General Electric Company, it is clear that General Electric Company was not legally represented by anyone before the Delhi High Court in Writ Petition Civil No. 1280/ 2012 from 30.4.2014 onwards. 1. Were the Powers of Attorneys dated 4.5.2012 and 29.4.2013 allegedly executed by Alexander Dimitrief and Bradford Berenson lawful and valid authority documents whereby K Radhakrishnan was appointed as the authorized signatory of General Electric Company for the purpose of Writ Petition Civil No. 1280/ 2012 before the Delhi High Court? 2. Were these documents placed on the court record by Nanju Ganpathy genuine or fraudulent? 3. Did K Radhakrishnan impersonate as the authorized signatory of General Electric Company before the Delhi High Court and file unauthorized and false affidavits? 4. Was Advocate Nanju Ganpathy authorized to represent and appear for General Electric Company? K Radhakrishnan is not an employee of General Electric Company. He has described himself in his affidavits as the company secretary of GE India Industrial Private Limited, a fully owned Indian subsidiary of General Electric Company. 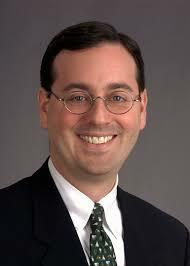 Alexander Dimitrief was Vice President, Litigation & Legal Policy of General Electric Company from 9 February 2007 until November 1, 2011 when he was appointed as General Counsel of GE Energy. Alexander Dimitrief has been appointed as General Counsel of General Electric Company with effect from 1.11.2015. Mr Bradford Berenson was appointed as the Operational Officer for Litigation & Legal Policy for General Electric Company on 15 October 2012. 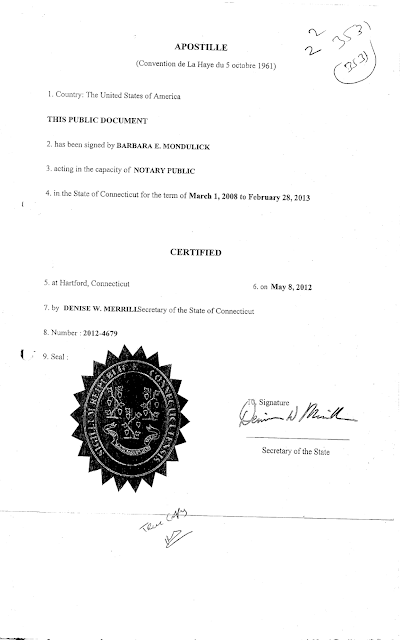 Were the Powers of Attorney dated 4.5.2012 and 29.4.2013 allegedly executed by Alexander Dimitrief and Bradford Berenson legal and valid in law? The authority of individuals to sign documents (including court pleadings) on behalf of General Electric Company emanates from Board Resolution dated 26.4.1988 as incorporated in the Board Minutes of General Electric Company (last revised on November 6, 2009). 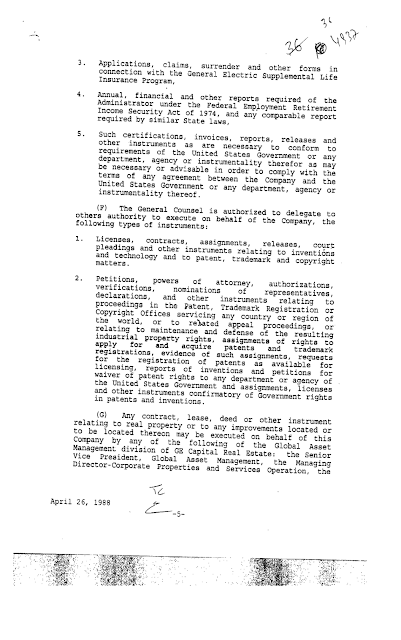 Under this Board Resolution, both Alexander Dimitrief and Bradford Berenson had the authority to sign court pleadings and powers of attorney on behalf of General Electric Company for litigation purposes but they had no authority to further delegate this authority to anyone. (iii) by a Manager or Acting Manager of the relevant Division or Department of General Electric Company. 1. Summon the records of Respondent Nos. 2, 4 and 5 on the whistle-blower complaints made by the Petitioner and after examining the records and hearing the Respondents, issue a writ of mandamus to Respondent 4 directing that Respondent 7 be disqualified and Respondent Nos. 1, 6 and 7 be black-listed from the Diesel and Electric Locomotive Tenders (Global RFQ No. 2010/ ME (Proj)/ 4/ Marhoura/RFQ and RFQ No. 2010/ Elect. (Dev0 440/1(1)). 2. Issue writs of mandamus to Respondent Nos. 2, 4 and 5 directing them to respond to and act upon the said whistle-blower complaints in accordance with law. 3. Direct that Respondent No. 2 inquire into the commission of criminal offences (including forgery, bribery and public corruption) arising out of the Petitioner’s whistle-blower complaints and direct prosecution of GE employees and government officials and public servants found involved and complicit. 4. Enforce and protect the right to life of the Petitioner and direct that the Petitioner be provided full protection and safety and be immediately relocated to a safe house. 5. Pass such other and further orders as this Hon’ble Court may deem fit and proper." K Radhakrishnan is not an employee of General Electric Company and Alexander Dimitrief and Bradford Berenson had no authority to delegate to K Radhakrishnan any authority to execute either court pleadings or powers of attorney on behalf of General Electric Company in relation to Writ Petition Civil No. 1290/2012 filed in the Delhi High Court. The Powers of Attorney dated 4.5.2012 and 29.4.2013 executed by Alexander Dimitrief and Bradford Berenson respectively were therefore illegal and invalid documents and which therefore conferred no authority upon K Radhakrishnan to represent himself as the authorized signatory of General Electric Company before the Delhi High Court. K Radhakrishnan therefore effectively impersonated as the authorized signatory of General Electric Company and the affidavits filed by him before the Delhi High Court were unauthorized, false and perjurious. Brackett Denniston (who retired as General Counsel of General Electric Company on 31.10.2015), Alexander Dimitrief and Bradford Berenson knowingly participated in a criminal obstruction of justice conspiracy to falsify powers of attorney with intent to enable K Radhakrishna to unlawfully impersonate as the authorized signatory of General Electric Company before the Delhi High Court in a whistleblower litigation involving complaints and evidence of corruption by General Electric Company. K Radhakrishnan was used to commit a fraud on the Delhi High Court, on the Government of India and on General Electric Company itself. K Radhakrishnan was used to sign and file false and unauthorized affidavits in the Delhi High Court. Information about this litigation was suppressed by Brackett Denniston, Alexander Dimitrief, Bradford Berenson and Jeffrey Eglash, all senior level in-house lawyers for General Electric Company. For a more detailed examination of the documents and to see the documents, please continue to read on. 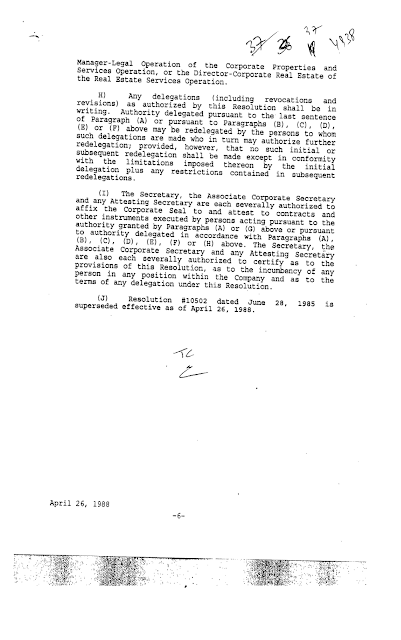 This note describes how GE effectively evaded the summons issued by the Delhi High Court and how Denniston, Dimitrief and Berenson issued fraudulent authority docs violating GE's own board resolution so that an employee of GE's Indian subsidiary could "impersonate" as General Electric Company's authorized signatory before the Delhi High Court. This is a very serious matter and a violation of US law and Dimitrief and Berenson should lose their jobs for this and get disbarred. Criminal charges for obstruction of justice would lie. This amounts to fraud and criminal impersonation. It is a fraud on General Electric Company itself. Someone impersonated as General Electric Company's authorized signatory before a court. A high level executive/ lawyer of GE would otherwise have had to file affidavits before the Delhi High Court. The GE India employee K Radhakrishnan was used to file false affidavits as part of the cover-up. I guess Dimitrief and Eglash did not want to commit perjury.themselves. Also, it appears as if my entire litigation was outsourced by GE. The intent was to conceal my litigation records from GE. GE will not have the full court record of this litigation. General Electric Company is a large conglomerate incorporated in the United States. Notice was issued by the Delhi High Court to General Electric Company on 7.3.2012. Advocate Nanju Ganpathy appeared on 9.5.2012 claiming to represent General Electric Company and continued to appear thereafter. Mr Nanju Ganpathy was at that time and until recently a Partner in the law-firm AZB & Partners. Affidavits were filed on behalf of General Electric Company through one K R Radhakrishnan on 3.7.2012 and 3.8.2012. 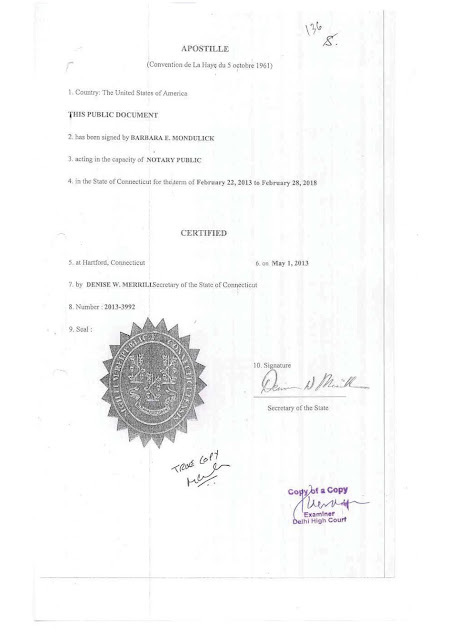 No authority documents establishing K Radhakrishnan as authorized signatory of General Electric Company were produced. Nanju Ganpathy filed a photocopy of a document self-describing as a Power of Attorney executed by one Alexander Dimitrief on 4.5.2012. This document had a validity of one year. 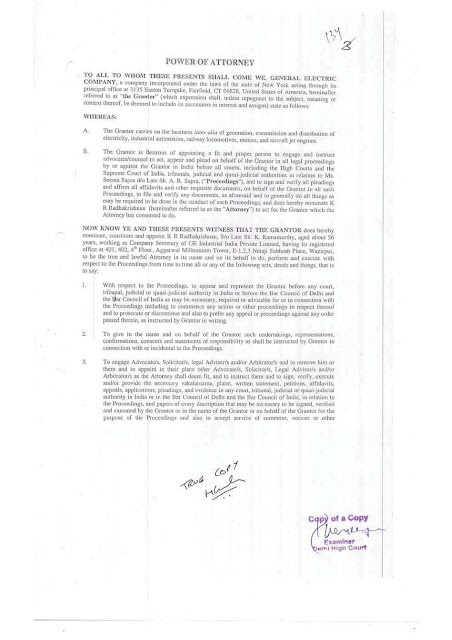 A copy of this document was emailed by Nanju Ganpathy to the petitioner after repeated requests on November 12, 2012. The petitioner filed CM 18642/2012 on 16 November 2012 pointing out the defects with this alleged authority document and that this document was invalid. Appellant discovered that no vakalatnama had been filed by Nanju Ganpathy so Appellant moved CM 19370/ 2012 (on 6 December 2012). Electronic case history maintained by the Delhi High Court registry shows that a vakalatnama was filed only on 7.12.2012. CM 19683/2012 was filed by Appellant on 14.12.2012 pointing out that the vakalatnama dated 7.12.2012 was invalid and did not annex the required authority documents. 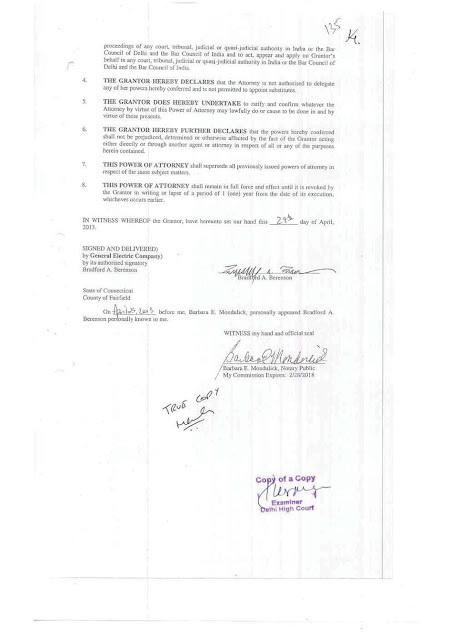 Affidavit of K Radhakrishnan filed on 7.1.2013 producing an extract from the Board Minutes of General Electric Company containing Board Resolution No. 10855 (last revised on November 6, 2009 and hereinafter referred to as the Board Resolution) which describes and limits the authority of individuals to sign documents (including court pleadings) on behalf of General Electric Company. Petitioner filed CM 522/2013 on 14.1.2013 pointing out that the board resolution of General Electric Company placed on the court record showed that the alleged Power of Attorney document was ultra-vires, illegal and invalid. Attached to this vakalatnama dated 16.7.2013 was a photocopy of a document self-describing as a power of attorney allegedly executed on 29 April 2013 by Bradford Berenson on behalf of General Electric Company. This was also only valid for one year. The petitioner filed CM 10493 of 2013 on 19.7.2013 pointing out that the new vakalatnama dated 9.5.2013 was also invalid as was the Power of Attorney allegedly executed by Bradford Berenson dated 29.4.2013. Since none of the petitioner’s applications on this issue were being heard or even taken up by the Delhi High Court, and because Nanju Ganpathy continued to appear for General Electric Company without a valid vakalatnama and since K Radhakrishnan continued to impersonate as authorized signatory of General Electric Company, the petitioner was constrained to move another application on this issue on 21 November 2014 being CM 18969 of 2014. Attached to this application as Annexure P-6 was a specimen signature of Bradford Berenson which was completely different from the signature on the alleged Power of Attorney dated 16.7.2013 and on the alleged vakalatnama dated 9.5.2013. It is submitted that in any event, since the Power of Attorney dated 29.4.2013 was valid only for one year, it lapsed and ceased to have legal effect from 29.4.2014 onwards. Mr Bradford Berenson was appointed as the Operational Officer for Litigation & Legal Policy for General Electric Company on 15 October 2012. This was in the same position that Alexander Dimitrief occupied until November 1, 2011. Curiously, this crucial Operational Officer position at General Electric Company was not filled for almost a year until 15 October 2012. The authority of individuals to sign documents (including court pleadings) on behalf of General Electric Company emanates from Board Resolution No. 10855 (last revised on November 6, 2009). as incorporated in the Board Minutes of General Electric Company. This Board Resolution is reproduced hereinafter enclosed in a separate table. The language of the Power of Attorney dated 4.5.2012 allegedly executed by Alexander Dimitrief and the Power of Attorney dated 29.4.2013 allegedly executed by Bradford Berenson is also reproduced hereinafter enclosed in separate tables. K Radhakrishnan is not an employee of General Electric Company and Alexander Dimitrief and Bradford Berenson had no authority to delegate to K Radhakrishnan the authority to execute either court pleadings or powers of attorney (or vakalatnamas which are a special form of power of attorney) on behalf of General Electric Company in relation to Writ Petition Civil No. 1290/2012 filed in the Delhi High Court. K Radhakrishnan therefore impersonated as the authorized signatory of General Electric Company and the affidavits filed by him before the Delhi High Court were unauthorized, false and perjurious. Brackett Denniston (who retired as General Counsel of General Electric Company on 31.10.2015), Alexander Dimitrief and Bradford Berenson knowingly participated in a criminal obstruction of justice conspiracy to falsify fraudulent and invalid powers of attorney with intent to enable K Radhakrishna to unlawfully impersonate as the authorized signatory of General Electric Company before the Delhi High Court in a whistleblower litigation involving complaints and evidence of corruption by General Electric Company. K Radhakrishnan was used to commit a fraud on the Delhi High Court, on the Government of India and on General Electric Company itself. K Radhakrishnan was used to sign and file false and unauthorized affidavits in the Delhi High Court. The Chairman reminded the Board that the resolution dealing with the execution of contracts and other instruments on behalf of the company had last been reviewed and revised by the Board in June, 1985, at which time the resolution had been modified to reflect changes in the Company’s organization ad to change its form to make periodic organization updatings unnecessary under ordinary circumstances. The Chairman noted that the principal purpose of this resolution is to indicate to persons outside the Company the individuals within the Company who have authority to sign various documents. 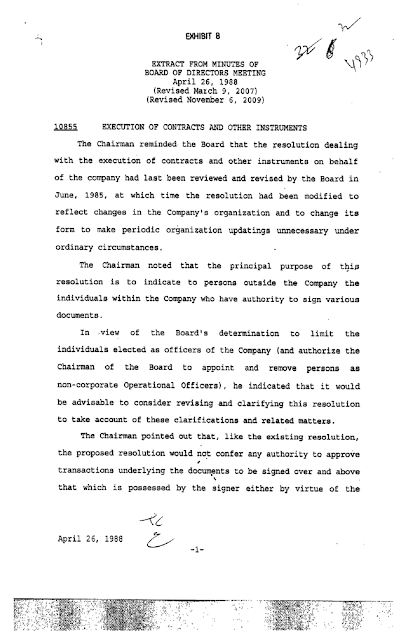 In view of the Board’s determination to limit the individuals elected as officers of the Company (and authorize the Chairman of the Board to appoint and remove persons as non-corporate Operational Officers), he indicated that it would be advisable to consider revising and clarifying this resolution to take account of these clarifications and related matters. 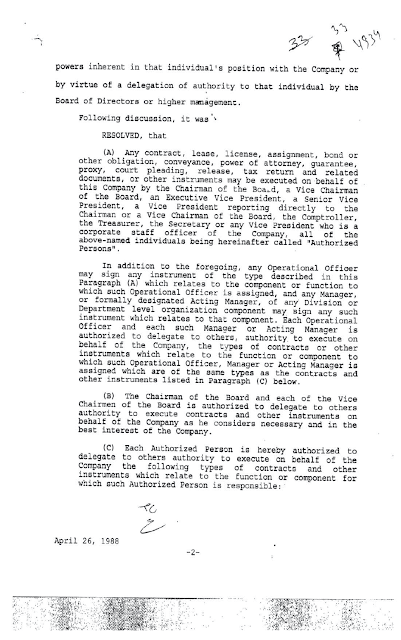 The Chairman pointed out that, like the existing resolution, the proposed resolution would not confer any authority to approve transactions underlying the documents to be signed over and above that which is possessed by the signer either by virtue of the powers inherent in that individual’s position with the Company or by virtue of a delegation of authority to that individual by the Board of Directors or higher management. “(A) Any contract, lease, license, assignment, bond or other obligation, conveyance, power of attorney, guarantee, proxy, court pleading, release, tax return, and related documents, or other instruments may be executed on behalf of this Company by the Chairman of the Board, a Vice Chairman of the Board, an Executive Vice President, a Senior Vice President, a Vice President reporting directly to the Chairman or a Vice Chairman of the Board, the Comptroller, the Treasurer, the Secretary or any Vice President who is a corporate staff officer of the Company, all of the above-named individuals being hereinafter called “Authorized Persons”. 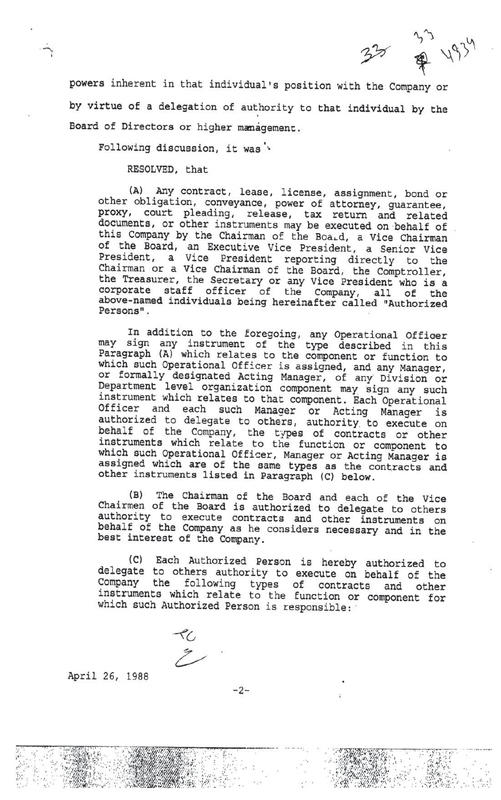 In addition to the foregoing, any Operational Officer may sign any instrument of the type described in this Paragraph (A) which relates to the component or function to which such Operational Officer is assigned, and any Manager, or formally designated Acting Manager, of any Division or Department level organization component may sign any such instrument which relates to that component. Each Operational Officer and each such Manager or Acting Manager is authorized to delegate to others, authority to execute on behalf of the Company, the types of contracts or other instruments which relate to the function or component to which such Operational Officer, Manager or Acting Manager is assigned which are of the same types as the contracts and other instruments listed in Paragraph (C) below. (B) The Chairman of the Board and each of the Vice Chairmen of the Board is authorized to delegate to others authority to execute contracts and other instruments on behalf of the Company as he considers necessary and in the best interest of the Company. 6. Powers of Attorney authorizing agents and attorneys to transact business of the Company with the U.S. Customs Service and with customs authorities in other countries. 1. Licences, contracts, assignments, releases, court pleadings and other instruments relating to inventions and technology and to patent, trademark and copyright matters. 2. Petitions, powers of attorney, authorizations, verifications, nominations of representatives, declarations, and other instruments relating to proceedings in the Patent, Trademark Registration or Copyright Offices servicing any country or region of the world, or to related appeal proceedings, or relating to maintenance and defense of the resulting industrial property rights, assignment of rights to apply for and acquire patents and trademark registrations, evidence of such assignments, requests for the registration of patents as available for licencing, reports of inventions and petitions for waiver of patent rights to any department or agency of the United States Government and assignments, licenses and other instruments confirmatory of Government rights in patents and inventions. (G) Any contract, lease, deed or other instrument relating to real property or to any improvements located or to be located thereon may be executed on behalf of this Company by any of the following of the Global Asset Management division of GE Capital Real Estate: the Senior Vice President, Global Asset Management, the Managing Director-Corporate Properties and Services Operation, the Manager-Legal Operation of the Corporate Properties and Services Operation, or the Director-Corporate Real Estate of the Real Estate Services Operation. H) Any delegations (including revocations and revisions) as authorized by this Resolution shall be in writing. Authority delegated pursuant to the last sentence of Paragraph (A) or pursuant to Paragraphs (B), (C), (D), (E) or (F) above may be redelegated by the persons to whom such delegations are made who in turn may authorize further redelegation; provided, however, that no such initial or subsequent redelegation shall be made except in conformity with the limitations imposed thereon by the initial delegation plus any restrictions contained in subsequent redelegations. 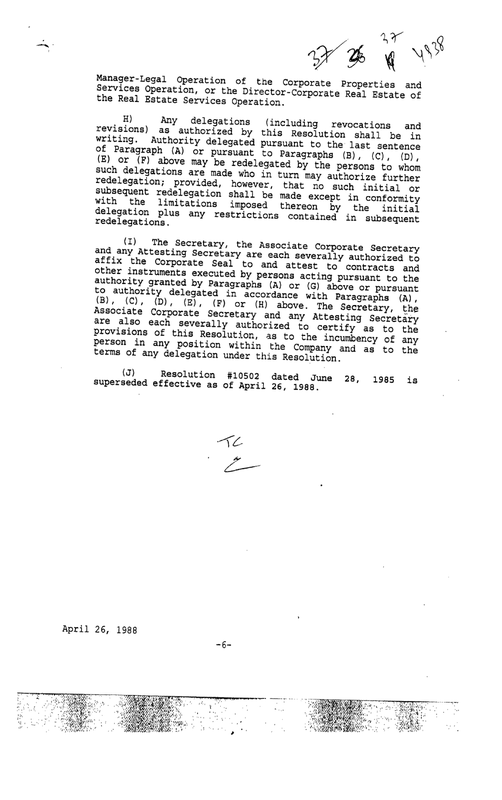 (I) The Secretary, the Associate Corporate Secretary and any Attesting Secretary are each severally authorized to affix the Corporate Seal to and attest to contracts and other instruments executed by persons acting pursuant to the authority granted by Paragraphs (A) or (G) above or pursuant to the authority delegated in accordance with Paragraphs (A), (B), (C), (D), (E), (F) or (H) above. The Secretary, the Associate Corporate Secretary and any Attesting Secretary are also each severally authorized to certify as to the provisions of this Resolution, as to the incumbency of any person in any position within the Company and as to the terms of any delegation under this Resolution. 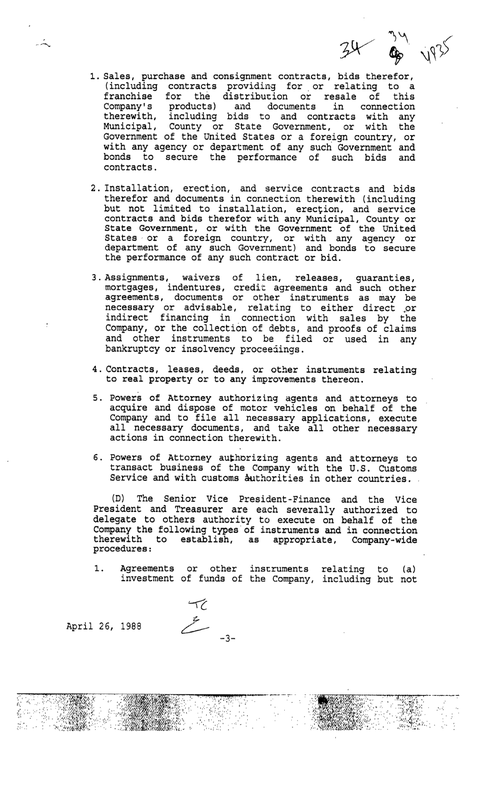 (J) Resolution #10502 dated June 28, 1985 is superseded effective as of April 26, 1988. Reproduced below is the language of the Power of Attorney allegedly executed by Alexander Dimitrief. This document is also invalid because it incorrectly identifies K R Radhakrishnan, the alleged Attorney by wrongly describing him as son of K R Radhakrishnan and by recording his address incorrectly. A. The Grantor carries on the business inter alia of generation, transmission and distribution of electricity, industrial automation, railway locomotives, motors, aircraft jet engines. B. The Grantor has been impleaded as a party to certain proceedings before the Delhi High Court filed by Ms. Seema Sapra, an advocate enrolled with the Bar Council of Delhi (“Proceedings”) and for the purpose of these Proceedings the Grantor is desirous of appointing a fit and proper person to prosecute and defend and for that purpose to appear and represent the Grantor before the Delhi High Court and the Supreme Court of India as may be necessary, in relation to the Proceedings and does hereby nominate Mr. K. R. Radhakrishnan (the “Attorney”) to act for the Grantor which the Attorney has consented to do. 1. With respect to the Proceedings to appear and represent the Grantor before the Delhi High Court and the Supreme Court of India as may be necessary for or in connection with the Proceedings, and also to prefer any appeal or proceeding against any order passed therein, as instructed by us in writing. 2. To give in the name and on behalf of the Grantor such undertakings, representations, confirmations, consents and statements of responsibility as shall be confirmed and instructed by us in connection with or incidental to the Proceedings. 3. 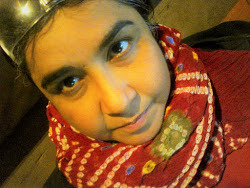 To engage Advocate/s, Solicitor/s, legal Adviser and/or Arbitrators, and to instruct them and to sign, verify, execute and/or provide the necessary vakalatnama, plaint, written statement, petitions, affidavits, appeals, applications, pleadings, and evidence in the Delhi High Court and the Supreme Court of India, in relation to the Proceedings, and papers of every description that may be necessary to be signed, verified and executed by the Grantor or in the name of the Grantor or on behalf of the Grantor for the purpose of the Proceedings and also to accept service of summons, notices or other proceedings of the Delhi High Court and the Supreme Court of India and to act, appear and apply on our behalf in the Delhi High Court and the Supreme Court of India. 4. THE GRANTOR HEREBY DECLARES that the Attorney is not authorized to delegate any of his powers hereby conferred and is not permitted to appoint substitutes. 5. THE GRANTOR DOES HEREBY UNDERTAKE to ratify and confirm whatever the Attorney by virtue of this Power of Attorney may lawfully do or cause to be done in and by virtue of these presents. 6. THE GRANTOR HEREBY FURTHER DECLARES that the powers hereby conferred shall not be prejudiced, determined or otherwise affected by the fact of the Grantor acting either directly or through another agent or attorney in respect of all or any of the purposes herein contained. 7. 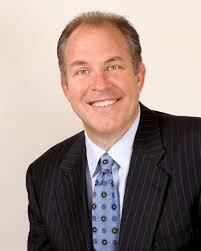 THIS POWER OF ATTORNEY shall supersede all previously issued powers of attorney in respect of the same subject matters. 8. THIS POWER OF ATTORNEY is strictly limited to act as a signatory on behalf of the Grantor, in respect of documents in relation to the Proceedings, which are specifically pre-approved in writing by the Grantor in advance. This Power of Attorney does not empower the Attorney to exercise any discretion on behalf of the Grantor or to do any other act other than as specified herein. 9. THIS POWER OF ATTORNEY is governed by, and shall be construed in accordance with the laws of India and shall remain in full force and effect until it is revoked by the Grantor in writing or lapse of a period of 1 (one) year from the date of its execution, which ever occurs earlier. IN WITNESS THEREOF the Grantor, have hereunto set our hand this 4th day of May, 2012. 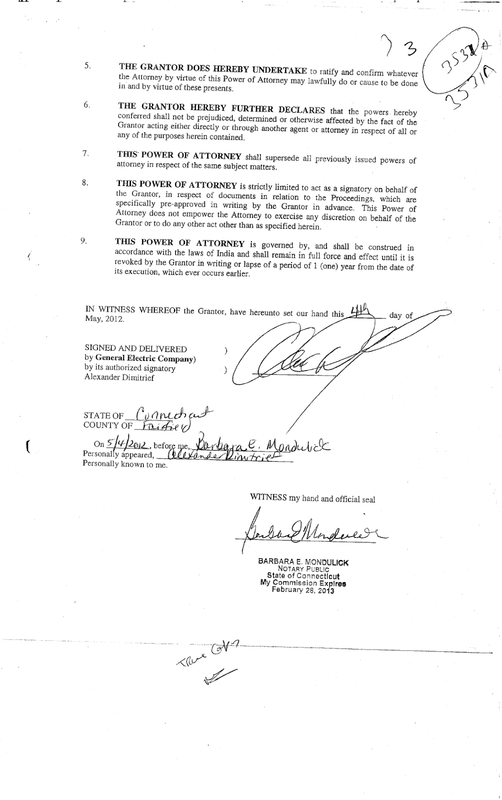 Reproduced below is the language of the Power of Attorney allegedly executed by Bradford Berenson in 2013. This document is also invalid because it incorrectly identifies K R Radhakrishnan as “working as Company Secretary of GE Industrial India Private Limited” whereas the relevant Company’s name is GE India Industrial Private Limited. Here K Radhakrishnan’s age is given as 56 years whereas in the Power of Attorney from 2012 his age is shown as 53 years. His affidavits from 2013 filed in Writ Petition Civil No. 1280/2012 also mention his age as 53 years. B. The Grantor is desirous of appointing a fit and proper person to engage and instruct advocates/counsel to act, appear and plead on behalf of the Grantor in all legal proceedings by or against the Grantor in India before all courts, including the High Courts and the Supreme Court of India, tribunals, judicial and quasi0judicial authorities in relation to Ms. Seema Sapra d/o Late Sh. A. R. Sapra (“Proceedings”), and to sign and verify all pleadings and affirm all affidavits and other requisite documents, on behalf of the Grantor in all such Proceedings, to file and verify any documents, as aforesaid and to generally do all such things as may be required to be done in the conduct of such Proceedings, and does hereby nominate K. R. Radhakrishnan (hereinafter referred to as the “Attorney”) to act for the Grantor which the Attorney has consented to do. 1. With respect to the Proceedings to appear and represent the Grantor before any court, tribunal, judicial or quasi-judicial authority in India or before the Bar Council of Delhi and the Bar Council of India as may be necessary, required or advisable for or in connection with the Proceedings including to commence any action or other proceedings in respect thereof and to prosecute or discontinue and also to prefer any appeal or proceeding against any order passed therein, as instructed by Grantor in writing. 2. To give in the name and on behalf of the Grantor such undertakings, representations, confirmations, consents and statements of responsibility as shall be instructed by Grantor in connection with or incidental to the Proceedings. 3. To engage Advocate/s, Solicitor/s, legal Adviser/s and/or Arbitrator/s, and to remove him or them and to appoint in their place other Advocate/s, Solicitor/s, Legal Adviser/s and/or Arbitrator/s as the Attorney shall deem fit, and to instruct them and to sign, verify, execute and/or provide the necessary vakalatnama, plaint, written statement, petitions, affidavits, appeals, applications, pleadings, and evidence in any court, tribunal, judicial or quasi-judicial authority in India or in the Bar Council of Delhi and the Bar Council of India, in relation to the Proceedings, and papers of every description that may be necessary to be signed, verified and executed by the Grantor or in the name of the Grantor or on behalf of the Grantor for the purpose of the Proceedings and also to accept service of summons, notices or other proceedings of any court, tribunal, judicial or quasi-judicial authority in India or the Bar Council of Delhi or the Bar Council of India and to act, appear and apply on Grantor’s behalf in any court, tribunal, judicial or quasi-judicial authority in India or the Bar Council of Delhi or the Bar Council of India. 4. THE GRANTOR HEREBY DECLARES that the Attorney is not authorized to delegate any of her powers hereby conferred and is not permitted to appoint substitutes. 8. THIS POWER OF ATTORNEY shall remain in full force and effect until it is revoked by the Grantor in writing or lapse of a period of 1 (one) year from the date of its execution, whichever occurs earlier. IN WITNESS THEREOF the Grantor, have hereunto set our hand this 29th day of April, 2013. A similar clause exists in the Bradford Berenson Power of Attorney. These clauses essentially provide that the instructions to the alleged attorney K R Radhakrishnan need not directly emanate from General Electric Company but might come via any number of layers of unnamed, unidentified and undisclosed intermediaries including other agents or attorneys. Thus these alleged powers of attorney also fail to provide or establish a direct link between K R Radhakrishnan and General Electric Company. Therefore, not only does K R Radhakrishnan have no direct knowledge of the facts involving General Electric Company, the actual source of his knowledge is also not General Electric but one or more layers of unknown intermediaries. These Powers of Attorney were therefore nothing but a device to create several degrees of separation and distance between Writ Petition Civil No. 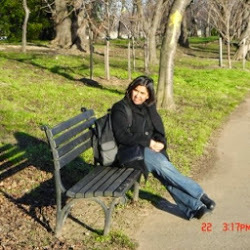 1280/2012 and General Electric Company and between General Electric Company and its alleged attorney K R Radhakrishnan. The above facts raise several issues. K R Radhakrishnan impersonated as the authorized signatory of General Electric Company before the Delhi High Court, The Powers of Attorney allegedly executed by Alexander Dimitrief and Bradford Berenson produced before the Delhi High Court were invalid, illegal and fraudulent. The three vakalatnamas produced for General Electric Company were invalid, illegal and fraudulent. Mr Nanju Ganpathy and other lawyers who appeared for General Electric Company in this matter at different times (including Mr Rajiv Nayar, Mr Rakesh Tiku, Mr Manpreet Lamba, Mr Kartik Yadav) all appeared without authorization. All affidavits filed in this matter through Mr K R Radhakrishnan purporting to be on behalf of General Electric Company were unauthorized, false, perjurious, hearsay and inadmissible. Can a company like General Electric Company, one of the largest and richest corporations in the world, avoid appearing before an Indian court like the Delhi High Court in a writ petition seeking writs directing the Indian Government to act on complaints and evidence of corruption against the Company in a high value tender matter, by appointing an outsider as arms-length power of attorney to represent it in the proceedings. Does this not amount to avoiding the summons of the Court? The Petitioner has accessed other Powers of Attorney or authority documents for General Electric Company publicly available on the internet and in all those documents, the document is duly attested by an attesting secretary of General Electric Company. No such attestation by an attesting secretary of General Electric Company appears on the alleged Powers of Attorney allegedly executed by Alexander Dimitrief and Bradford Berenson and produced before the Delhi High Court in Writ Petition Civil No. 1280/2012. All the applications filed by the petitioner setting out the above objections to the authority documents for K R Radhakrishnan and Advocate Nanju Ganpathy were simply adjourned by several Delhi High Court Benches and were never considered or taken up for hearing in the three years during which Writ Petition Civil No. 1280/2012 remained pending in the Delhi High Court.